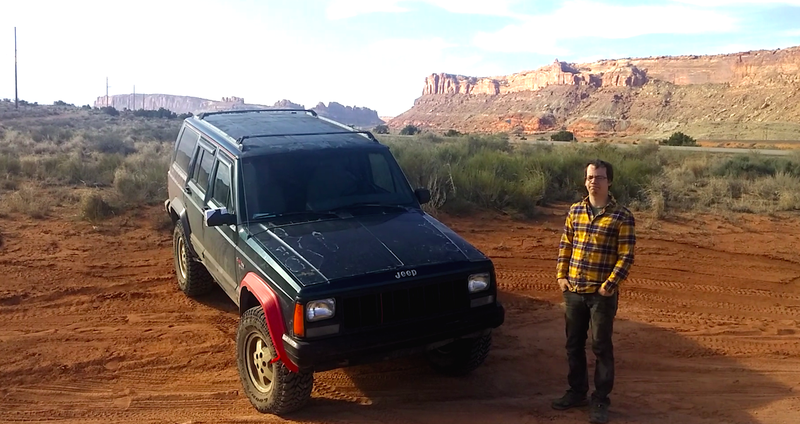 After months of wrenching, I embarked on an epic adventure in my $600 Craigslist-purchased Jeep Cherokee. That trip took my Project Swiss Cheese over 4,000 miles of highway and on some of America’s most beautiful off-road trails. Here’s how much the whole adventure cost. Last fall, I drove to St. Clair Shores, Michigan and purchased this beast for 600 bucks from a high-school student. Then, over the course of a couple months, and with the help of some awesome readers, I installed a lift kit and tons of other stuff to make this XJ reliable enough for the 1,750 mile trek to Moab. What “tons of other stuff” did I install and how much poorer did I end up? Let’s break it down. As someone who had owned two Jeep Cherokees before, I was familiar with the boxy SUV’s weak spots, and there were plenty. As such, I did a lot of preventative maintenance to make sure I didn’t fail. I was deathly afraid of having to write an article about how I ended up on the side of I-75 just a few miles from my house. So, driven by fear, I diagnosed the crap out of the Jeep. The radiator was cracked, the water pump was leaking, the brakes were garbage, the fluids were dirty, half the lights didn’t work, and the suspension was useless. So the Jeep got all new springs and shocks, which I acquired for a measly $120. It also got a new cooling system, new brakes and brake lines, and new fluids. Here’s the long list of expenses, broken into two sections: parts I had to purchase specifically for this project, and parts I poached from one of my other Jeeps. So the total amount of money spent specifically for this build was approximately $1,600. But there are quite a few other parts on the Jeep that aren’t accounted for in that figure, because as a Jeep hoarder, I was able to pull from the many useful parts sitting around my garage. I nabbed most of these parts from the red Jeep that I blew up a few months back. I figured the engine on that Jeep, with its two severed connecting rods, wasn’t going to need a water pump or radiator anytime soon, and it wasn’t not going to be sending power to any tires. So I stole those parts and threw them onto Project Swiss Cheese. I’ve included this section to provide an idea of how much it would have cost me to put this Jeep together if I hadn’t had access to my Jeep parts stockpile. If I hadn’t been able to pull parts from my other Jeep, or from my stash of Jeep stuff, I’d have purchased the following components from either junkyards or Craigslist. The values in this list are based on local junkyard parts lists and my knowledge of the local Craigslist Jeep parts market. If you spend enough time looking, you can find 31-inch tires on Craigslist priced at under $200 for a decent used set, and a used radiator can be bought at a junkyard for $35. My local yard sells trailer hitches for $25, and transmission oil coolers run about eight bucks. The gas tank and transfer-case skid plates I stole from my red Jeep actually originally came from a junkyard, and were purchased for somewhere close to $11 and $15, respectively. Of course, there are some parts I wouldn’t bother buying used, like transmission oil cooler hoses, water pumps, harmonic balancers and brake hard-lines. Though I had all those lying around in my garage, if I weren’t a parts hoarder, I’d have grabbed them new from the parts store. So if you add up the totals from the previous two sections, you’ll find that the total value of Project Swiss Cheese and all of its new parts, is somewhere close to $2,000. Obviously, my methodology wasn’t exactly “air-tight,” but the point is: if you somehow landed a $600 XJ in the same shape as mine, and you wanted to replace all the same parts that I replaced, you’d probably wind up spending about two grand, assuming you lived in a place with similar junkyard/Craigslist/parts store pricing. I’m not going to go into detail on travel costs, but I ate PB&J much the time, and lodged either on the side of the road in my Jeep, or on a cold garage floor. So my food and lodging costs totaled maybe a couple hundred dollars for the trip. As for gas prices, the whole trip took my Jeep about 4,000 miles. At an average of 15 MPG, and $2 per gallon gas, that’s about $533 in fuel expenses. But I didn’t just go to Moab without backup. I was prepared for the worst, so I dove into my Jeep parts-pile, and nabbed a spare starter motor, alternator, serpentine belt and rear driveshaft. Those parts, if purchased at a local Detroit-area junkyard, would probably cost about $71.50. There were some parts that I wanted to have spares for just in case, and that weren’t in my junk-pile. So I had to go out and purchase those specifically for the trip. If you add the two totals above, you wind up with $349.59. That number represents approximately how much money I’d have had to spend if I wanted to bring all those spare parts, but I didn’t have a bunch of junky parts to pick from. So in the end, if you add up the cost of the Jeep, titling fees, parts purchased expressly for the trip, the value of parts pulled from my Jeep treasure-trove, and gas, you wind up with a total trip cost of about $2,881. Throw in a week’s worth of PB&J, and it was pretty much a $3,000 affair (plus many hours of blood, sweat and tears). Three grand for a beast of an off-roader and a week in heaven? I think that’s pretty decent, even if it’s far from the $600 I initially paid for the Jeep itself.